Cry Havoc is an aspirational LARP Battle tactics event based in historical 1513. Players will be recruited into an army and will undertake a weekend of military training based on historical battle tactics. Go to the Cry Havoc website for more details. Professionally run weapon training events using Live Action Roleplay (LARP) weapons. Structured lessons on a range of weapon combat principles and varied weapon techniques. Specially designed combat games, performance enhancement strategies and tournaments. Back in January 2003 I found out that I was wrong, really wrong. I used to think I was big, strong and fast for my size. I then started playing American football and discovered that 6’2” (now 6’1”) and 18 Stone (Now 21St) was actually quite small. I also found out that the guys smaller than me were stronger than me and the guys bigger than me were faster than me. This didn’t stop me and I stuck at it, I had the opportunity to be coached by some amazing coaches, play alongside some of Europe’s top players and experience top flight football, becoming bigger, stronger and faster in the process. A similar thing happened this weekend when I turned up at a Scout hut in a little village in East Sussex for the Riddle of Steel Weapons Training weekend. I turned up with my two large axes thinking I knew how to fight. A childhood spent in multiple fighting classes and over a decade of American football had to count for something right? I’d also found that whilst at Empire in most 1 on 1 situations I could come out of it ok. It turns out I was wrong again. I had originally booked for only the Sunday but due to a game on the Saturday being cancelled it freed up my whole weekend and I went straight down on the Friday. This was the first time I’d met Mark Gilbert and knew nothing of his reputation and ability. I initially signed up as it would mean getting to fight and since I’d stopped playing football I really missed the contact but the chance to learn and improve was a big selling point as well. After helping set up one of the fields we grabbed weapons and the few of us there early went and had a play. What happened straight away was that I died, I died a lot and I died quickly. I died when I went against Mark, I died when I went against the other two students/attendees/pupils/member (I don’t know the appropriate term) and I died when I went up against Mark’s young son. I still had a lot of fun but it made me realise quite how much I had to learn. The Saturday morning started with an introduction, a warm up and then straight into a simple game to get everyone going. Again it was fun, and again I died a lot, occasionally something would work and I’d get a hit on someone but mostly I died. After the first game we had our first lesson and that set the format of the weekend. Roughly 30 minutes of lessons followed by 30 minutes of games. Each lesson was something new, building on skills we had practised earlier in the day. It would usually start with instruction and a demonstration and then time for us to practice. What was really great was the way we all helped each other learn. Each time I pared up with someone we would discuss the thing we were working on and try and help each other improve. I think I was able to get a lot more out of these exchanges since I had so much to learn and less experience to share but I still think I was able to add the occasional point here or there. One thing I really thought was great was how much emphasis was placed of safe fighting. It the system we were using head shots were fine but face, neck and groin shots didn’t count. When going for the head we were expected to be safe and any time there was a technique that could have ended up catching the head we were shown how to avoid this. We were taught to keep the tip of the sword a safe distance from our opponents body to prevent accidental injury. This was about how to win a fight with safe weapons and not how to hurt someone with them. The games were mostly set around a castle and bridge that had been set up using an old tent, some wooden posts, some hessian, some ropes and a piece of canvas to make a tunnel. At times we were attacking the castle, at others we were trying to cross the bridge. Sometimes we were fighting zombies and others we were holding back invaders. Sometimes we were just trying to kill each other, or a specific target. Considering the games were the same group of people, in the same space with the same equipment it was impressive how they felt so different. Rather than just a simple “Group A is trying to kill group B”, or “Group A has to get past group B” the games all had some background and some fluff to bring them alive. I particularly enjoyed the wondering around as a Zombie deliberately misinterpreting orders. Near the end of day 1 we had a tournament and I ended up getting drawn against Mark, it genuinely felt like all that happened was I stepped in the ring, got hit twice and left. It sucked as I didn’t really get the chance to join in, and by this point I felt there were a few people I had a small chance against but a big part of the lesson was about the mechanics of being in a tournament and experiencing what it was like. To that end it worked and whilst I would have like to get some other fights that’s just how it goes sometimes, and it’s not as if there was a lack of fighting over the weekend. It would be remiss of me if I didn’t talk about the quality of the coaching. As I told Mark on the first night I have very high expectations when it comes to coaching. I’ve done a fair bit myself at a very high level and I expect coaches to be as good as me or better. I don’t think that’s a very high standard to set but I’m really looking for the attitude and the thinking that I try to bring to my coaching. The whole weekend it was never an issue, all of the coaches/trainers were of a very high standard. They knew their stuff, they were able to deliver clearly and they were able to identify where I was getting things wrong and give short simple instructions on how to change them. What’s more they were all happy to listen to suggestions and answer questions. Even if it was from someone like me with very little experience questioning why they step the way they do. At the end of the first day, after about 12 hours of the game/lesson routine we were then presented with the hardest challenge of the whole weekend, basic maths. Mark handed us a self-assessment form to grade ourselves from 1-5 in various areas and then work out averages and our training and sun frazzled minds found that just too much. It was a great tool to help us asses where we are but also to look at areas to target for improvement. I found it really positive because I was feeling a bit down about my abilities at that point but it highlighted areas that I was actually able to score myself quite highly (such as strength) so I was able to see it wasn’t quite as bad as I thought. It also highlighted that all the areas I was weak could be massively improved by more experience and practice. We also spent some time feeding back to Mark about the day’s training and ways to improve it. What was great was that Mark was so open to our ideas, he wants to be the best training he can be and he knows that only happens if he keeps trying to improve. This is such a positive attitude as it’s very easy for people to be closed off to suggestions. Not only did Mark ask for them he even incorporated some of them into the next day. Day two started with pain, the day before was long and my muscles were complaining but breakfast, a warm shower and some light sparing was enough to get them to shut up and let me get on with the day. One of the first things we learned on Sunday was using a shield. Up until that point any attempt to use a shield just resulted in it getting in my way (and me dying). It was during this lesson that something started to click and things started to work. Once I got the hang of the shield I found it much easier to follow the first rule of sword fighting (don’t get hit). This in turn gave me more time to get my own strikes in. I was still losing more exchanges than I was winning but the number had definitely shifted in my favour. With this came a much greater confidence and a feeling that I had a chance (if only a very small one) against everyone there. We had another tournament the second day, this time with some of the bouts getting filmed for analysis later (an idea I shared for American Football) and the first round losers taking part in their own tournament. I thought this was great as it meant I’d get at least two bouts in no matter how I did. As it turns out I didn’t need to worry as I was able to win my first bout, against someone who I wasn’t able to get close to the day before. It was a close run fight that could have gone either way but I really felt like I was reading it far better and really thinking about what I wanted to do rather than just making it up as I went along. The second round saw me drawn against Mark again and whilst the result was exactly the same (2-0 to Mark without me landing a hit) the whole experience was a lot better. In both rounds we exchange blows before Mark was able to land a strike and Mark had to react to the strikes I was throwing at him. On the journey that is learning to sword fight I’ve only made my first steps on road that never ends but in terms of progress from where I started the weekend I’ve travelled miles. Already the filming is starting to pay off, even though my bout with Mark was so short I’ve been able to discuss it with people on the Facebook group. I’ve watched it about 30 times already and have seen what I did right and what I did wrong. Getting that feedback from others on the positive and negative points really helps you improve. Any more film I can get of me fighting is going to go up on there to hopefully also get feedback on. There are so many other things I could discuss that made the weekend so good but one bit I can’t leave out that was truly its strongest point was everyone else that attended. I don’t always do well with groups of new people, especially if I don’t know anyone at all and can become very introvert. I didn’t even have the chance to do that as everyone was so friendly and welcoming. Everyone was happy to help and everyone was happy to chat. It was the interactions with everyone else that changed it from being a training course to becoming part of a group who all want to become better fighters and I’m looking forward to the opportunity to meet up again, at either the next course or another event, even if it means that are trying to kill me. As a final though, this was the first time Mark has run one of these and it is still being developed as a weekend program, he kept stressing the need for us to include as much as possible in our feedback forms so he can improve the program. This will make it even better but even without changes I’d go back again. I paid about £90 for the whole weekend, which included 2 nights (on the floor but that’s ok) 5 meals and roughly 8 hours of high quality training from 4 different coaches, 8 hours of different battle games and weekend hanging out with some truly awesome people. To me that’s a bargain. If you want to learn the basics of sword fighting, or are a high level sword fighter and want to learn some new skills, or just want the chance to test yourself against other good fighters, then I would highly recommend signing up for the next weekend. Whatever happens you will have a lot of fun and meet some great people. A big thank you to Mark for putting the course on, and to everyone one else that helped with the organising, the food the coaches and especially to everyone else who came along and made the weekend so much fun. 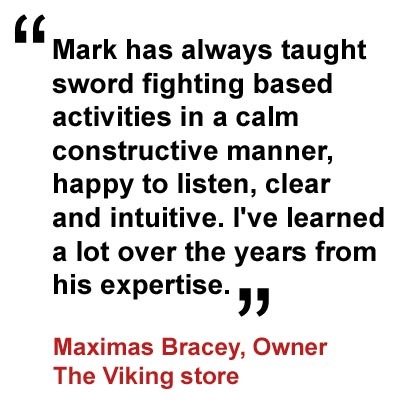 Or hire Mark to come to your venue and run weapon training for you and your group for a day or the whole weekend. Contact Mark on 07984601756 for more information. Exciting medieval combat days using specially constructed realistic looking high density foam swords, axes, maces, spears and shields that are typically used in Live Action Roleplay (LARP). This fighting equipment means that you have the freedom to engage in light contact medieval combat without the need of any restrictive protective equipment. Well yesterday was my first Warrior Day with Riddle of Steel (ROS). I thought I’d leave a few comments on here so others can judge for themselves if this sort of thing is for them. First off, to give a bit of context I’ll say a little about myself. I’m 44 in March, a typical middle aged larper (hence the paunch). I’ve been larping since I was 16, so by no means unfamiliar to Larp combat and average in a fight at best. 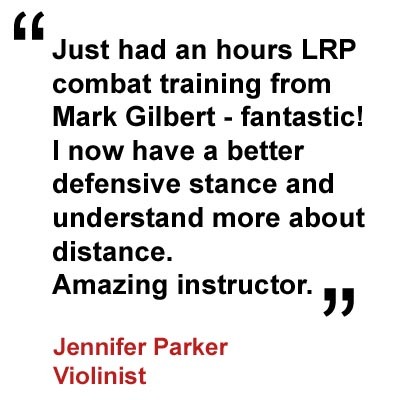 I’ve seen Mark train others and been to a few sessions of his over the years, so knew that he was a patient and encouraging teacher, with a ton of experience to share. The day was nearby and in my budget so I thought why not give it a go. What I wanted out of the day was really just three things 1) to improve my technique so that I could fight expending a whole lot less energy and be a damn sight more deadly too 2) build my confidence and awareness up so that I got more out of Larp fighting and was able to defend more effectively 3) some transferable skills/knowledge that I could weave into my role playing, a grizzled veteran warrior character should be able to talk the talk after all. I arrived at Horam Manor and got a warm welcome from Mark Gilbert and the other attendees. My ticket was scanned and I was led to the training ground.I’d brought my own kit in order to make use of the own kit discount. I’d brought a bit to much, but thankfully there were plenty of willing hands to help. The walk to the training ground is a few minutes from the site cafe. It was bit slippy but no more than you’d expect from a wood in February. The other attendees were a mix of people between early forties and teens. It wasn’t a solely male group either. All of them were a country mile better fighters than me, having trained with Mark before. This was very encouraging indeed as there was very little in common between them, so to my mind it shows that the ROS approach to training is suitable for everyone, even a portly middle aged man like myself. Right from the get go Mark established a sharing and supportive atmosphere and even though I was new to ROS, I was encouraged to add my own thoughts in the theory discussions, as well as give the other attendees constructive feedback on their fighting practise. I certainly felt very included and it helped that the practise exercises meant that we learned from each other as well as from Mark. The day ran for six hours. Breaks and Lunch were called when needed. I worked hard but by no means did I get to the point where I felt that I had overcooked it. Or felt pressured into more physicality than my unfit body could handle. Today I’m achey but feel like my body got the right level of exercise. The weather has by no means been pleasant. I was expecting the training ground at Horam Manor to be either indoors or on gravel, the U.K. Being universally muddy at present. I wrong on both counts, although the walk to the forest training ground from the car park was a bit slippy, the training ground was not. Sheltered under pine in a wide glade, the soft pine needles made it easy to fight on and nicer to fall onto than mud or gravel. By the car park there were toilets and a site cafe. I’d arrived a little early and treated myself to a bacon role. Boy was it good!!! The cafe is large, homely and has a great menu. Next time I might stay after the event a little longer and treat myself to a carvery there. Would I recommend ROS Warrior Days to anyone else? Yes- most definitely. Not only did I learn a lot, but I had fun and lots of laughs too. Whatever your ability I’d recommend ROS, there isn’t anything like it really. Go to the Warrior Day page for more information and to find the directions. These weekends are designed to fuse, wilderness skills, medieval sword fighting and archery in a roleplay setting. Inspired by the training that Strider, from Lord of the Rings, must have had in order for him to become an effective ranger. Sessions will include: Shelter principles, Fire by Friction, Water purification, Tracking, Stealth, Bird Language, Open fire cooking, Principles of weapon combat (LARP weapons) and Archery (LARP arrows). Sessions will be taught by wilderness skills professionals, with all combat elements lead by Mark Gilbert.